The first versions of the propeller were derived from a rotating screw design, which was first invented by the ancient Greek scientist Archimedes in 200 BC. These early screws were used by ancient civilizations to lift water from wells with much less effort. In the mid-1400s, Leonardo da Vinci reimagined the screw concept for a different purpose: a flying machine. Sketches of his first helicopter design (which he never built) include an upward-facing “air screw” that he believed would lift off the ground with enough rotation. By the mid-1700s, inventors were using the rotating screw design as a means to propel boats and ships through the water. Marine propellers with multiple blades soon became standard technology on a variety of different vessels, and variations of the screw design are still used to this day. Soon after the first hot-air balloon flight in 1783, inventors began to experiment with methods of propelling and controlling both lighter-than-air and heavier-than-air aircraft. Jean Baptiste Marie Meusnier envisioned an enormous airship that was to be driven by three hand-cranked propellers, though his design was never built. In 1852, Jules Henri Giffard invented the first full-size powered airship, which used a three-bladed propeller paired with a 3-horsepower steam engine. And in 1873, aviation pioneer Alberto Santos-Dumont built steerable aluminum airships powered by large wooden propellers. Over the next few decades, numerous heavier-than-air flying machines were designed and built using propellers based on the screw-shaped design. However, it wasn’t until the early 1900s that the first successful airplane – and the first successful airplane propeller – finally came to fruition, thanks to the Wright Brothers. Using data from their innovative wind tunnel tests, the Wrights realized that aircraft propellers should be shaped more like a wing, or airfoil, as opposed to a screw. They found that propeller blades act much like a rotating wing, but instead of creating lift, the spinning blades displace air backward to produce forward thrust. The Wrights also came up with the idea of adding a twist along the length of each propeller blade, which gave the blades a more consistent angle of attack with each rotation. The first propellers were made from wood and were fixed pitch, which greatly limited the performance capabilities of the aircraft. In 1929, Wallace Turnbull patented his design for a variable pitch propeller, which allowed the pilot to manually adjust the blades’ pitch and maintain better control over the aircraft’s performance and operational efficiency. Later, constant-speed propellers were developed, which are variable pitch propellers that adjust pitch automatically to maintain a constant rotational speed. Most of today’s high-performance propeller aircraft use constant-speed props because they offer better performance and fuel efficiency. After the Wright Brothers’ breakthrough design in 1903, propeller technology advanced rapidly. While the Wrights’ propellers were about 82% efficient, today’s propellers operate at around 90% efficiency. Modern propellers are made from aluminum or composite materials and range from two to six blades. Hartzell Propeller has been at the forefront of aircraft propeller design and manufacturing since the early days of aviation. In fact, our history dates back to 1917, after Orville Wright suggested Robert Hartzell start manufacturing hand-carved propellers from his walnut wood factory. 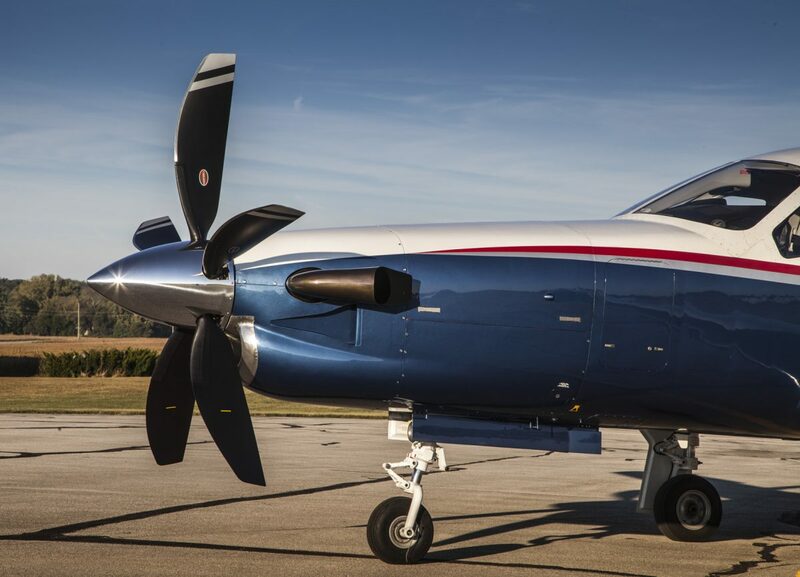 Since the very beginning, Hartzell Propeller has committed to producing highly advanced aircraft propellers designed for safety, reliability, and maximum performance. You can learn more about our aircraft propeller systems here.